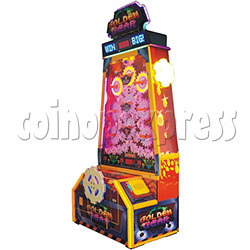 Golden Gear Skill Test Redemption Machine is a sliding ball from gear playfield ticket machine. The play field designs with the gears at different levels, the obstacles area at different locations, different scores designs at the bottom, the JACKPOT set in particular at the score partition. Player try to guide the ball to drop at high score place at bottom by the gearwheel to win the scores. That machine physical design is unique, and gameplay is novel and simple, will attract every player. Player insert coins to start the game, machine release a ball at the top of play field, player turn the gearwheel left or right to steer, guide the ball to the score partition to win the corresponding scores, if the ball fall into the JACKPOT partition, player win the JACKPOT scores. In the end, the player can get the corresponding tickets.